Yang Jiechi, Foreign Minister of China, a veto-wielding member, spelt out clearly his country’s opposition to fresh sanctions in early February. Later in March, at a press conference, he said pressure and sanctions are not the fundamental way forward to resolving the Iran nuclear issue. Iran has taken three major steps in recent weeks to show doubters within its own establishment and in the rest of the world that the Americans and some of their key allies, caught in the quagmire of global recession and still feeling their way for an honourable exit from Iraq and Afghanistan, are beginning to morph unambiguously into full-blown paper tigers. The Iranian establishment has also arrived at the conclusion that within the framework of a global power shift, West Asia is transforming rapidly. There is a growing perception in Tehran of an emerging power vacuum in the region. This situation, in Tehran’s view, has arisen mainly on account of the growing weakness of Israel, especially after the debacle it suffered at the hands of the Iran-backed Hizbollah in the 2006 summer war in Lebanon. Iran firmly believes that eventually it would be joined by Turkey, Syria and Lebanon, and possibly Saudi Arabia, which is already working with Syria to stabilise a polarised Lebanon, to engender a new security order in the region. Many in the Iranian establishment are of the view that China and Russia are poised to emerge as the new global players in West Asia. Faced with a spirited opposition for several months, the Iranian government recently went into overdrive to interpret the events of February 11, which marked the 31st anniversary of the 1979 Islamic Revolution, as a turning point. For the first time since the June 12 presidential elections, and the spate of protests that followed, the government that day arrived at the conclusion that it had established firm control over the streets of Tehran. The regime’s confidence was based on its success in mobilising millions of supporters, who thronged Tehran’s iconic Azadi square to mark the Revolution anniversary. In sharp contrast, the opposition on February 11 failed to make an impression, belying expectations, in the western media and academic circles, of a strong showing. Confident that he was back in the saddle after the show of strength, President Mahmoud Ahmadinejad went ahead with significant statements on the nuclear issue, which suggested that a new phase of confrontation between Iran and the West began. 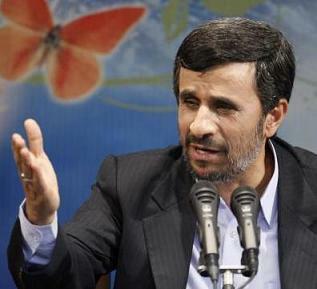 In his address at the Azadi square rally, Mr. Ahmadinejad announced that Iran had already enriched the first batch of uranium to 20 per cent purity. In effect, his declaration closed negotiations that commenced during the Vienna nuclear talks held earlier in October last. At the Vienna talks, in which Iran, the U.S., Russia and France participated, Mohamed ElBaradei, former chief of the International Atomic Energy Agency (IAEA), made a proposal. He circulated a draft calling for swapping the lightly enriched uranium domestically produced by Iran with nuclear fuel rods made by France. These fuel rods were required to run a Tehran research reactor, engaged in production of medical isotopes to treat cancer patients. According to the IAEA proposal, Tehran would transfer the bulk of its stocks of Low Enriched Uranium, purified to a 3.5 per cent level, to Moscow. Russia, in turn, would enrich the material to a 20 per cent level, and send it to France for fuel fabrication. The arrangement suited the West well. Once the material was converted into fuel rods, Iran would have found it technically impossible to use it for making atomic weapons — the primary concern of global powers. On the contrary, Iran, citing past experience, expressed serious doubts about receiving timely and assured supplies of fuel rods for its reactor. In early February, Iran also declared that it was well on its way to acquiring military deterrence based on the indigenous development of advanced weaponry. On February 2, it successfully fired the Kavoshgar-3 space launcher. Despite Iran’s emphasis that the vehicle would be used for civilian purposes, such as sending satellites into space, the launch was seen as a manifestation of its capability to develop long range ballistic missile technology. The launch of Kavoshgar-3 capped several successes Iran has recorded in the development of missiles. Most significantly, it had test-fired the Sejil-2 missile. The family of Sejil missiles uses solid fuel for propulsion. Solid-fuelled missiles usually make better battlefield weapons. They pack in larger quantities of the propellant, thereby acquiring a higher range. Moreover, unlike liquid-fuelled missiles, solid-fuelled weapons are less exposed to aerial attacks before takeoff, as they can be readied for the launch on the ground within a shorter period. In December 2009, the Iranians announced that they had optimised the Sejil-2 system, coating it with radar evading material. In recent years, Iran has also successfully tested the comparatively less sophisticated 2000-km range Shahab-4, and Shahab-3 missiles, which can strike at targets around 1,500 km away. The Iranian accomplishments in military hardware include the development of radar evading drones and the designing of stealth fighter jets. Their military advancements notwithstanding, the Iranians are fully aware that they are in no position to match the quality and sophistication of western military hardware. Consequently, they have worked seriously on the doctrine of “asymmetric warfare,” which, they believe, will give them sufficient fire power to inflict significant military, political and psychological damage on their foes. On their part, the Americans have taken the unilateral step of imposing additional sanctions on the Iran’s elite Islamic Revolution Guards Corps (IRGC). However, chances of the imposition of new international sanctions authorised by the United Nations Security Council, are receding fast. Yang Jiechi, Foreign Minister of China, a veto-wielding member, spelt out clearly his country’s opposition to fresh sanctions in early February, during a major international security conference held in Munich. Later in March, at a press conference held on the sidelines of China’s National People’s Congress, he reinforced his views: “As everyone knows, pressure and sanctions are not the fundamental way forward to resolving the Iran nuclear issue, and cannot fundamentally solve this issue.” Citing the Iranian threat to the oil rich Gulf, the U.S. has beefed up ballistic missile defences in four Gulf countries. Anti-missile weapons have also been positioned on some American ships deployed in the region. Besides, the Americans have launched a diplomatic offensive on Iran, evident in the recent visits to Qatar and Saudi Arabia by Secretary of State Hillary Clinton. The growing tensions in the region over Iran have escalated the war of words between the two adversarial camps. For instance, Israel and Syria, a key Iranian ally, have been engaged in a new round of sabre-rattling. On February 1, Israeli Defence Minister Ehud Barak warned Syria that the two countries might find themselves “in a forceful conflict that could lead to an all-out war.” Syria’s Foreign Minister Walid Muallem retaliated: “Israelis, do not test the power of Syria since you know the war will move into your cities.” He warned Israel that it should be prepared for a wider conflict even though it imposed its war only on southern Lebanon or Syria. Echoing the Syrian response, Hizbollah, Iran’s major ally in Lebanon, launched a full-scale verbal offensive on Israel. Hassan Nasrallah, head of Hizbollah, recently warned of a strike at Tel Aviv, something which was not done when the two clashed in the summer of 2006, in case Israel attacked any part of Lebanon. With neither the Iranians nor the Americans in a mood to budge, West Asia is witnessing a tense standoff, which seems unlikely to disappear anytime soon.